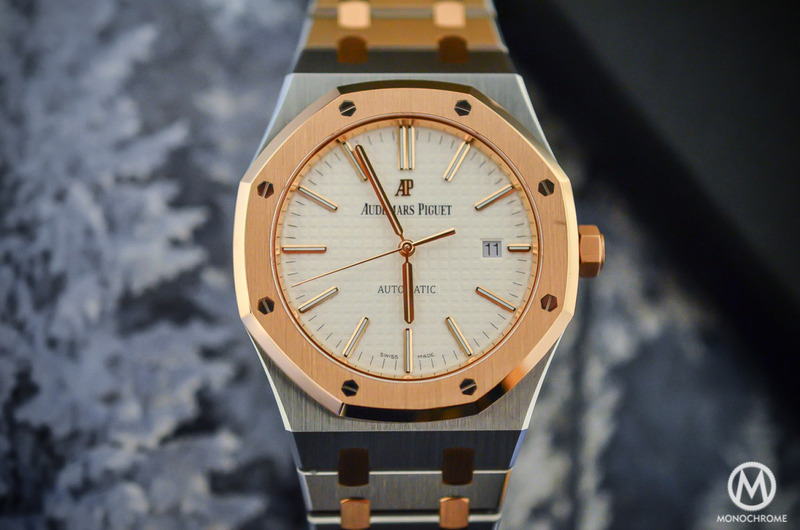 The legendary Audemars Piguet Royal Oak is back in the game and will again make some noise. 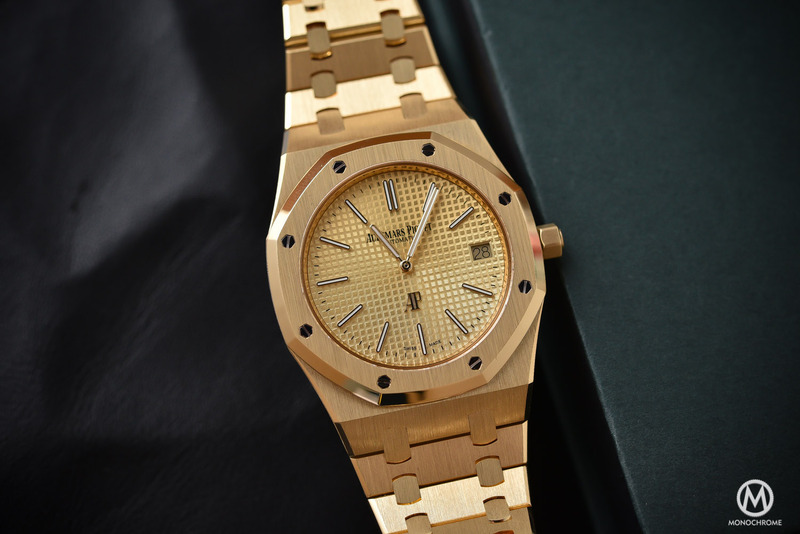 This watch, originally created in 1972 and designed by Gerald Genta, is an icon and AP know that very well. Just look at the number of variations and special editions that they created and you’ll understand why the brand is so keen on this watch. 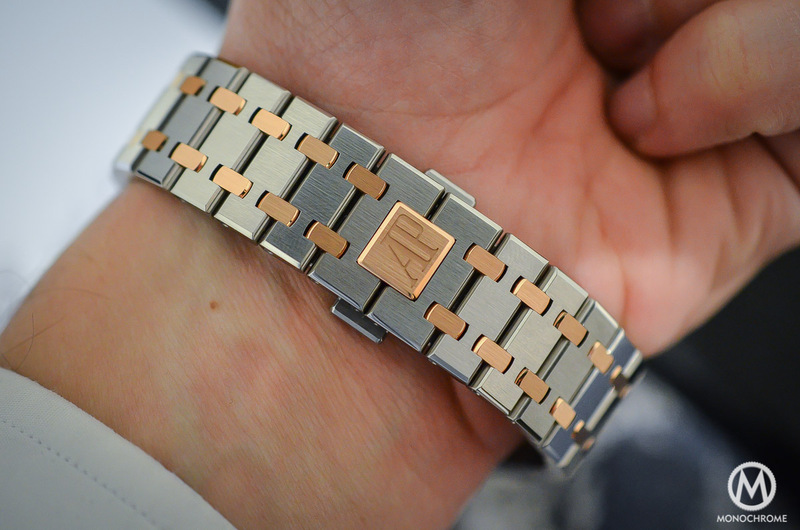 No big novelties for the SIHH 2015, but a reissue of a very well known edition: the RO bi-metal – stainless steel and gold. 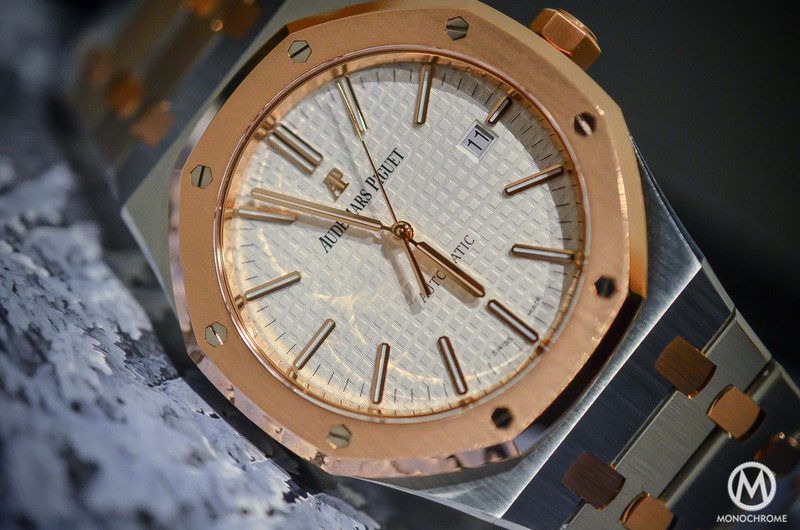 Here is the new Audemars Piguet Royal Oak 15400 Two-Tone. A two-tone Royal Oak is not entirely new for Audemars Piguet. 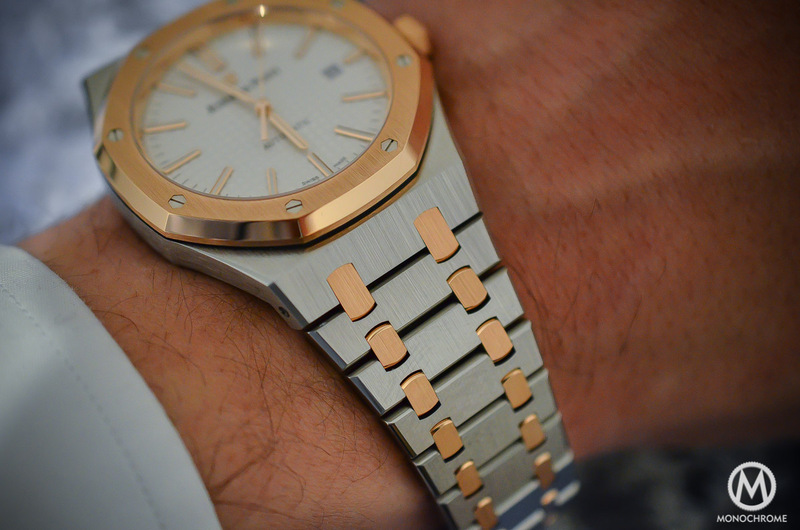 Back in the 1970s, the first edition of the Royal Oak, the extra-thin Ref. 5402 that is lovingly referred to as ‘Jumbo’, was already available in this combination of two metals – stainless steel and yellow gold to be precise – combined with a superb slate-grey dial. This timepiece is nowadays a rare bird with an increasing value. Even if European customers have never been really into two-tone watches, this vintage edition remains extremely appealing and brings a lot of charm to the usually cold and monochromatic Royal Oak Jumbo. 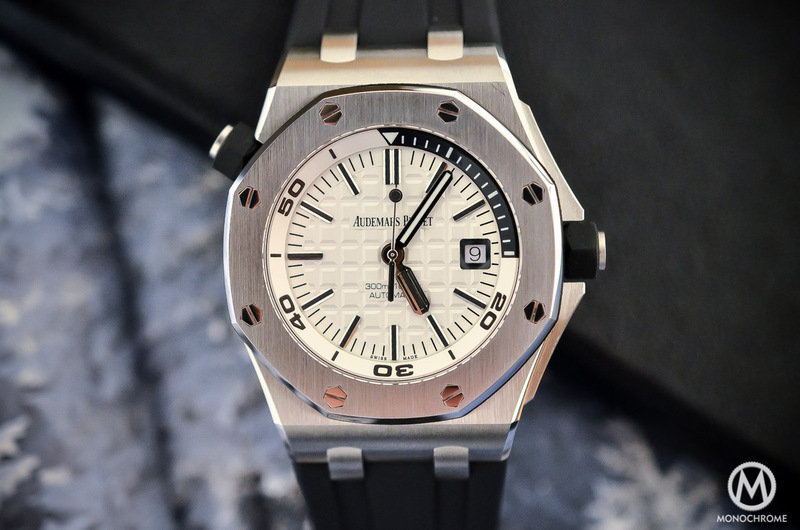 AP knows the attraction of this special watch and for the SIHH 2015, they decided to bring it back – well, at least the concept of a two-tone case and bracelet, as the technical content is not the same as the Jumbo. Within AP’s catalog, we have two main Royal Oak models; that is besides the numerous Royal Oak Offshore variations. First there’s Royal Oak ref. 15400, which is the evolution of the ref. 15300, albeit with a larger case of 41mm. The second one, ref. 15202 ST, which was re-designed for the Royal Oak’s 40th anniversary in 2012. 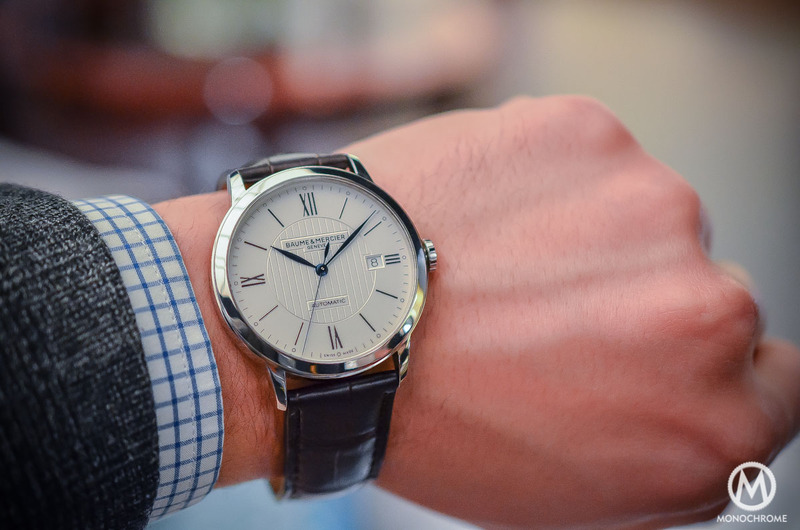 This is the rarer (and more expensive) variation however this one is the faithful descendant of the first ‘Jumbo’, with its 39mm case, its slim profile and extra-thin movement. Surprisingly, Audemars chose to use the first one to reintroduce the concept of a two-tone Royal Oak, instead of being totally faithful with its history – likely for commercial reasons, as the ref. 15400 is priced lower as the Ref. 15202ST. Anyway, even if the new Audemars Piguet Royal Oak 15400 Two-Tone is not a pure reedition, let’s have a closer look at it. 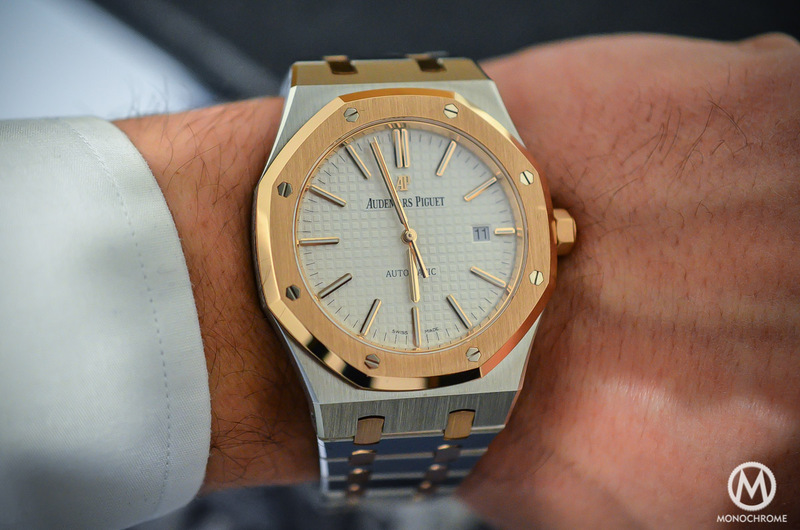 The Audemars Piguet Royal Oak 15400 Two-Tone is technically 100% similar to the steel edition. The differences are the visual aspects, meaning the case and the bracelet and also the dial. We told you that the old Two-Tone RO was fitted with a (superb) slate-grey dial. 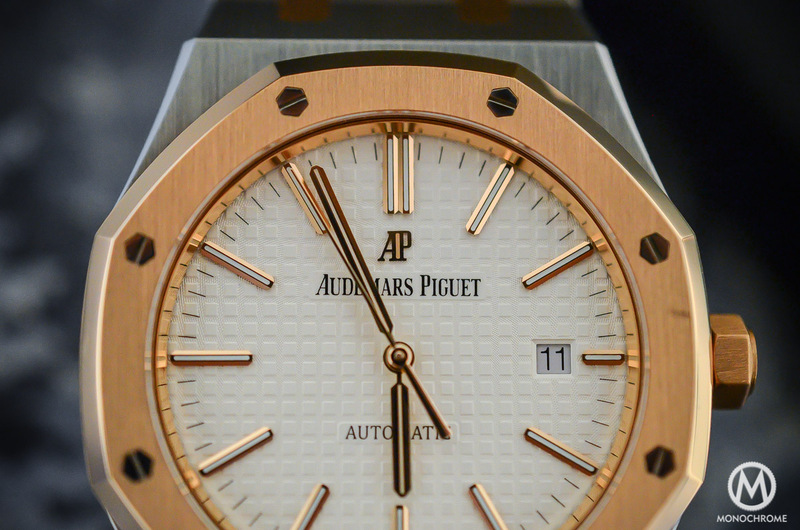 For this edition of the SIHH 2015, AP chose to introduce a bright dial. 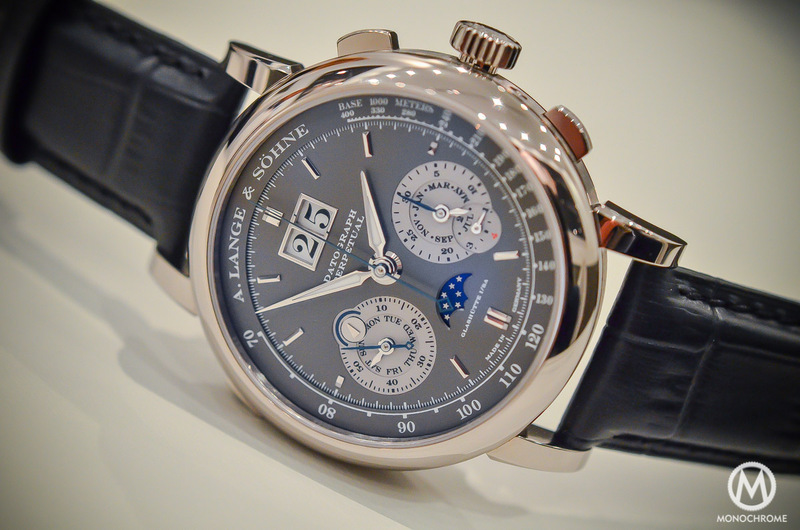 But don’t be confused, it is not the white-silver dial, as seen on the stainless steel ref. 15400 in stainless steel. This bi-metallic edition comes with an off-white / light cream dial in order to better match the gold used on the case. Besides its new color, the dial keep its “Grande Tapisserie” guilloché pattern and comes with pink gold applied hour-markers and Royal Oak hands with luminescent coating that matching the gold hands. The case and bracelet contain a substantial amount of 18K pink gold, as the bezel (with its 8 white gold screws), the screw-down crown and the connecting links of the bracelet are made in this precious metal. The movement is the same as in the stainless steel edition, being the self-winding manufacture calibre 3120 that features some nice finishing (beveled and polished bridges with Geneva Stripes on the flat surfaces, and circulair graining on the main plate) and the same engraved gold rotor. So now comes the biggest question: what to think about this two-tone and bright dial combination? First of all, we have to admit that this watch looks better in the flesh than on press pictures. It’s less shiny than expected (thanks to a fully brushed finish) and the contrast between the dial and the gold of the bezel looks better than we expected, due to its creamy tone. However, even when the ref. 15400 Two-Tone looks better than on we expected based on the press photos, it has the same “issues” as the stainless steel edition: too large, too thick, too showy. We have a strong preference for the extra-thin Jumbo ref. 15202, which is more faithful to the 1972 edition and more refined in pretty much every aspect. However, the Audemars Piguet Royal Oak 15400 Two-Tone will certainly find its audience and its buyers – we expect it to be very popular in some parts of the world (US and Middle East for instance, markets that are known to have an interest for bi-color combinations). So, mister Olivier Audemars (member of the owning family) and mister François-Henry Bennahmias (CEO of AP), could you please think about us in 2016, and introduce a two-tone Jumbo Ref. 15202 with slate-grey dial – or a least, a slate-grey dial version of this ref. 15400SR Two-Tone? 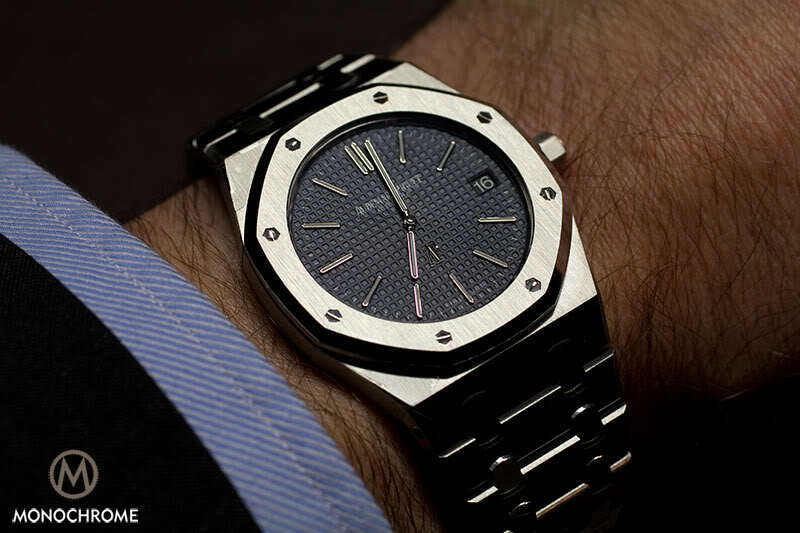 The Audemars Piguet Royal Oak 15400 Two-Tones will be priced at 25.600 USD (price in Euros is not yet set). For more details please visit Audemars-Piguet’s website. Case – Stainless steel case, glareproofed sapphire crystal and caseback, 18-carat pink gold bezel, links and screw-locked crown, water-resistant to 50 m.
Dial – Silver-toned dial with “Grande Tapisserie” pattern, pink gold applied hour-markers and Royal Oak hands with luminescent coating. Bracelet – Stainless steel and 18-carat pink gold bracelet with stainless steel AP folding clasp. Movement – Functions: hours, minutes, centre seconds, date – Movement thickness 4.26 mm – Total diameter 26.6 mm – Type of balance: Variable inertia blocks – Frequency of balance wheel: 3,00 (=21’600 alternances/hour) Hz – Bidirectional automatic winding – Power reserve: 60h. Shouldn’t the 8 screws be in white gold, as per all the other models? You are wrong! The bezel screws are in WHITE GOLD! Like all Royal Oak models. Please correct your info.